As part of its VMLogix line of products, Loftness introduces the Carbide Cutter G3 high-performance mulching head attachment for skid steers. This new-generation product is available with 51-, 61- and 71-in. cutting widths. All models are offered with a variety of carbide-tipped and heat-treated steel teeth to match any job application. For maximum cutting performance, the cutter features a two-stage cutting chamber with staggered counter teeth and a shear bar. This combination of features results in small particle sizes, while eliminating jamming and wrapping issues. 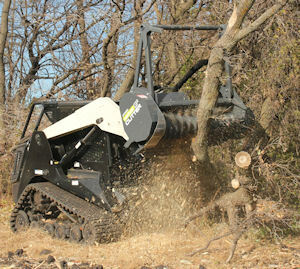 An optional primary-stage shear bar is also available for ultra-fine mulching. The mulching heads operate at 1,700 to 2,150 RPM and feature a four-groove banded belt drive with spring-loaded tensioner. They offer full rotation, thanks to specially designed hose routing. This feature also allows the units to easily position trees with the adjustable push bar and welded claw hooks. The push bar can be used to push falling brush and trees away from the power unit, and the claw hooks can pull material into position for proper feeding. Hydraulic push bar adjustment is optional.